Reading at the Harvard Bookstore with (from left to right, at the table):Susan Kushner Resnick, Eloise Klein Healy, Nicole Terez Dutton and Alicia Suskin Ostriker. In Lois Roma-Deeley's poems, she connects us to "something unnamed and unknowable from another world," through vivid imagery, exquisite language, and details that only someone innately intuitive could translate onto the page for us. She invites us to step outside of ourselves, in order to dig deep, with questions such as, whether "… it's at all possible / for anyone to slip into the holy nothingness of now?" We want to know more about the people in her poems. We want to know where they come from and where they are going, because ultimately, we are all searching for answers to the unknowable. These poems are mini, time-traveler sessions. I encourage you to read and re-read them. Each time, you may just journey to new places within the mind. Geology of Spirit- photo-poetic collaboration of four Arizona artists exploring the intersection of human spirituality and the desert Southwest. Two award-winning fine art photographers, Patrick O'Brien and Cyd Peroni, and two award-winning poets, Lois Roma-Deeley and Rosemarie Dombrowski, collaborated over a period of 18 months to create Geology of Spirit. · There is rebirth on the other side of decay. · Something powerful abides within the transience of time. While these themes grew organically from the collaboration, Rosemarie, Lois, Patrick, and Cyd have purposely left room for viewers to respond as part of a larger collaboration and wholeheartedly invite gallery-goers to bring their own stories to the exhibition. My new manuscript, Body, This, was short listed for the Spring 2018 Black River Chapbook Competition (Black Lawrence Press). From well over 700 entries, there were 19 semi-finalists and 8 finalists. Congratulations to all these wonderful writers! Lois Roma-Deeley is the author of four collections of poetry. The Short List of Certainties won the Jacopone da Todi Poetry Book Prize, published in 2017 by Franciscan University Press. Her previous poetry collections include: Rules of Hunger (2004), northSight (2006) and High Notes (2010), a 2011 Paterson Poetry Prize Finalist. This book forms the basis of a music drama, "The Ballad of Downtown Jake," for which she has written the book and lyrics. For her work on "Jake," Roma-Deeley was chosen as a 2015 ariZONI Theatre Award for Excellence Nominee, Original Script—Adult-Play or Musical, 2015. Rules of Hunger and northSight are her first and second poetry collections. She has won numerous awards and honors for her poetry and is the recipient of an Arizona Commission on the Arts, Artist Research and Development Grant, 2016. In 2012, Lois Roma-Deeley was named the U.S. Professor of the Year, Community College, by the Carnegie Foundation for the Advancement of Teaching and The Council for Advancement and Support of Education (CASE). Of the award, The Chronicle of Higher Education writes: "The honor is the nation's most prestigious teaching award, with national winners chosen from four types of institutions: a community college, a baccalaureate college, a master's institution, and a doctoral, research university." Roma-Deeley is the first national winner of this award that Arizona has ever had in any category. Scroll down this page and click on the video to hear Lois Roma-Deeley read her U.S. Professor of the Year acceptance speech. Benu Press awards The Samuel T. Coleridge Prize for "an outstanding work of literature, written by a contemporary author, that fulfills Coleridge's vision of the artist as a reconciling architect of the imagination. Such a work invites us to examine our understanding of the world, establishing new meaning in a just future transformed by possibility." Further, Roma-Deeley's poetry honors also include awards for the Allen Ginsberg Poetry Competition and the Emily Dickinson Poetry Competition, and recognition as a finalist in the Paumanok International Poetry Contest. Her poetry has appeared--or is forthcoming--in numerous in print and/or on line literary journals in the United States as well as in Great Britian, Germany, Australia, Canada, and India. In 2014, The Dr. Lois Roma-Deeley Creative Writing Scholarship Endowment was established by Paradise Valley Community College. Roma-Deeley was chosen as the 2013 Pacific Regional Faculty Member by ACCT (Association of Community College Trustees). In 2008, Roma-Deeley won the "Making a Difference for Women Award" from the Soroptimist International of Phoenix organization. Critics have called her poems "brilliant," "tough and brave," "poignant," “a vital chorus,” and "soul-satisfying." Literary critic Peter Huggins writes that, in northSight, Roma-Deeley "presents a cast of characters worthy of Dante." There are times–or is it always?–that poetry better articulates the human experience than we ourselves are able. When the world breaks, when the world crumbles, when we feel helpless and hopeless, overwhelmed. It is in those moments that we most need poetry. That poetry best serves us. At the moment, it seems as if every day is one of those days. The breaking days. The days when we must “watch TV with the sound turned off.” On these days “I know I will never understand a thing. / The world talks only to itself. / Rain to war. Child to dirt. / Bougainvillaea and TV." Her poems are published--or are forthcoming--in numerous anthologies, including, New Millennium (forthcoming), WAVES: A Confluence of Women's Voices (forthcoming); Voices of Power & Invisibility Anthology; Political Punch: Contemporary Poems on the Politics of Identity Anthology; Villanelles (Random House/Everyman's Library, Pocket Poets Series); Love Rise Up ; New Hungers for Old: One-Hundred Years of Italian-American Poetry ; The American Voice in Poetry: the Legacy of Whitman, Williams, Ginsberg; American Book Award winner Looking For Home; Letters to the World and others. Further, her work has been featured--or is forthcoming--in numerous literary journals nationally and internationally, including, Prime Number Magazine, Artemis, Antiphon, Quiddity, Zone 3, New Millennium Writing Anthology, Blue Heron Review, Panoply, Gyroscope Review (Anniversary Issue), Yes, Poetry, Feminine Rising Anthology, Five:2:One, SWWIM, North Dakota Quaterly,The New Engagement Literature and Art Journal, Presence, Rock & Sling, Rust + Moth, Verdad, Expound,Alyss, Lines + Stars, Eyedrum, Les Rêves des Notre Ours, Rabbit, The Windhover, The Tishman Review, Water~Stone, Redux, Spillway, The Wallace Stevens Journal, Faultline,Columbia Poetry Review, Comstock Review, The Citron Review, Hamilton Stone Review, Bellingham Review,5 AM ,Studio Poetry,Superstition Review, Artful Dodge, Italian Americana, Paterson Literary Review, Iris: A Journal About Women, A Women's Thing, About Place Journal,The Transnational (in English and German), Red Savina Review, and/or literary journal, Revolver, Helen, The Virginia Normal, Sonic Boom, Juked (on line), Profane Literary Journal, Elixir, Controlled Burn, Confluence,Sow's Ear (competition finalist), Iris, California Quarterly (CQ) and many others. Her work appeared on BestPoem.com. In collaborations with visual artists on several ekphrasis projects—extensively with visual artist and curator Beth Shadur—Roma-Deeley’s poems have been exhibited nationally and internationally. In 2018 and 2019, Lois Roma-Deeley works on two separate ekphrasis projects with Arizona visual artists and photograhpers. is a creative collaboration among four Arizona artists - two poets and two photographers, exploring e the intersection of the human and the wild in the desert Southwest. An exhibition is scheduled for 2019. In November of 2004 and 2005, Roma-Deeley was one of several featured poets participating in the interdisciplinary project called "A Poetic Dialogue: Poetry: Women: Art," a Chicago Humanities Festival event. In 2006, her work was featured in the Poetic Dialogue event hosted at the International Conference on Arts in Society at the University of Edinburgh, and published in the International Journal for Arts in Society. The poetry/visual art collaboration project has toured nationally, including at the Transconference at the University of Wisconsin, as well as internationally. She worked with curator Beth Shadur on the third Poetic Dialogue project, "Collaborative Vision." This pairing of 31 poets and visual artists was a featured show at the Chicago Cultural Center from January through April 2009. In 2015, the fourth collaboration, Convergence: The Poetic Dialogue Project, opened in Chicago. ( see bethshadur.com for more information). Further, one of Roma-Deeley's poems was featured on Beth Shadur's work as part of the "Cool Globes" project in Chicago, an innovative public art project of 124 globes designed to create awareness and inspire solutions to global warming. Cool Globes was on display along Chicago's lakefront from June to September, 2007. In 2011, Roma-Deeley's poem "In This Otherwise Small and Deserted Landscape" was selected to be part of Passage: A Public Art Project by Mags Harries & Lajos Heder . Passage is a multi-faceted public art project set at the new library of South Mountain Community College in Phoenix, Arizona. The different elements of the project focus on poetry and the landscape of South Phoenix. 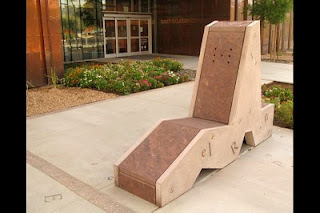 The Acoustic Chairs located in the front of the library plaza extend the architectural floor pattern into a mountainous landscape, relating to South Mountain. Speakers inside of the Chairs play recordings of poetry when someone sits down and activates a motion sensor in each seat. The public art project is funded by City of Phoenix Office of Arts and Culture Percent for Art program and the Maricopa County Community College District Bond Program. Roma-Deeley's poem "The Correct Yes" was exhibited with visual artist Mirjana Ugrinov's two panel painting, and was hung in the Ambassador's residence in Belgrade. The poetic sequence "Voices From The Aftermath: New York City Requiem" (northSight, Singularity Press, 2006) was put to music by composer Christopher Scinto and sung by the Phoenix Chorale (formerly Phoenix Bach Choir) in a special "Remembrance" concert for the fifth anniversary of 9/11. In 2015, "The Ballad of Downtown Jake," a music drama with music by composer Christopher Scinto, made its World Premier. "Jake" is based on Roma-Deeley's award-winning collection of poems High Notes for which she wrote the book and lyrics, made its World Premiere. Scroll down and click on the video to hear the full production. Roma-Deeley was nominated for an ariZoni award for Best Script, play or musical (Adult). "A Conversation with Martha Collins," written by Elizabyth Hiscox, Cynthia Hogue and Lois Roma-Deeley was published in the Writer's Chronicle, an AWP journal in 2011. Lois Roma-Deeley served as judge for the 2012 Binghamton University John Gardner Fiction Book Award. She choose Meg Wolitzer's The Uncoupling. In 2013, Roma-Deeley served as poetry judge for the Simmerman Poetry Award. Roma-Deeley has published six poetry book reviews in several literary journals, as well as serving for ten years as poetry co-editor for PKP Forum (formerly National Forum). Roma-Deeley is the recipient of an Arizona Commission on the Arts, Artist Research and Development grant, 2016. She has been a fellow at the Ragdale Foundation many times. Roma-Deeley has received grants for her writing from "Poets and Writers," Chicago Humanities Festival, Scottsdale Cultural Council and Tempe Cultural Council. Roma-Deeley has taught creative writing at the graduate and undergraduate levels for more than 25 years. She holds an MFA in Creative Writing (Poetry) from Arizona State University where she studied under the direction of Rita Dove, Norman Dubie and Alberto Rios. Roma-Deeley holds a Ph.D. in Interdisciplinary Studies with a Primary Emphasis in Poetry from the Union Institute and University. "The Geometry of Configurated Energy: A Poetic Theory" is the title of her doctoral project. She has given poetry readings nationwide, including: Distinguished Poets Series, Poetry Center (NJ); Bowling Green State University (OH); Molloy College (NY), Why There Are Words Reading Series (CA), Women and Children First bookstore (IL); University of Wisconsin--Waukesha (WI); Franciscan University (OH), Northern Arizona Book Festival (AZ); AWP Conference in Atlanta (GA); West End Reading Series in Ithaca (NY); Chicago Cultural Center (IL) Chicago Humanities Festival (IL); Clearwater Florida Public Library (FL); Harold Washington College (IL); Poets in Nassau (NY); Arizona State University (main, west and east campuses, AZ); Phoenix College (AZ); Austin Community College (TX); Suffolk County Community College (NY); Mesa Community College (AZ), Chandler-Gilbert Community College (AZ); Changing Hands Bookstore (AZ); Book Stall Bookstore (IL), Antigone Bookstore (AZ); Biblio Books (AZ), Reader's Oasis (AZ) Borders, Phoenix Writers Club (AZ) ARC Gallery (IL); ARTFIT (AZ) Scottsdale Museum of Modern Art (AZ) Scottsdale Cultural Council (AZ), Phoenix Poetry Series (AZ) and many others. In 2013, she was named Woman of Distinction by Maricopa Community Colleges' Women's Leadership Group. Roma-Deeley was accepted as a Fulbright Specialist candidate, 2012-2017. She is available for readings, seminars and creative writing workshops. Click on video to hear Lois Roma-Deeley's U.S. Professor of the Year acceptance speech. Lois Roma-Deeley’s fourth collection of poems, The Short List of Certainties, won the Jacopone da Todi Book Prize (Franciscan University Press, 2017). The Short List of Certainties explores the many ways in which we are blind to the depths of our fears and to the heights of our noblest selves. Experimental when necessary, but classic in design, Lois Roma-Deeley has woven together a narrative structure that traces the “hero’s journey” while reaching into and beyond the social issues of our time. Roma-Deeley’s writing entices the reader to join two strong-willed and modern, yet vulnerable feminist spirits, on this venture. The twin daughters of Hope —anger and courage— materialize and dematerialize throughout time, physical space, and social boundaries to liberate the world while destroying classic mandates. The twins struggle within themselves, argue with each other, and rage at the world as they fight against work-a-day violence, social injustices, and even Hope itself. The Short List of Certainties offers no easy answers for the brokenness found within ourselves and our world, but there’s no turning back now. The blind "what-if" awaits. Lois Roma-Deeley's award-winning poetry collection, Franciscan University Press. It’s been a long time since a collection has so affected me. Whether she is writing of our twisted relational lives ...of her own seemingly innate sense that something’s wrong, Roma-Deeley writes with that curious blend of authority and self-doubt that marks our best poets. Ultimately, and reassuringly, she finds the affirmation that sustains her through it all; as her title poem urges, “having courage, let us write a word or phrase on the short list of certainties something that sounds very much like praise.” Which is just what she does in this tour de force. ~Sydney Lea, author of twelve collections of poetry, finalist for the Pulitzer Prize in Poetry, former Vermont Poet Laureate. Click here to view a video poem of Lois Roma-Deeley's "The Sensei of Venice Beach"